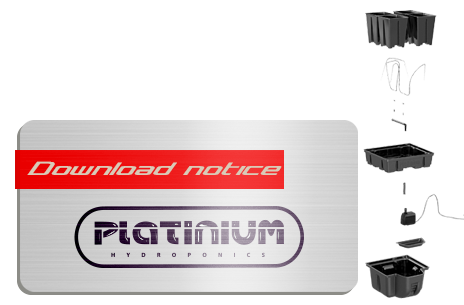 Platinium Hydroponics presents aerotop 40 to manage 1 to 5 plants. For beginners, pro and small spaces. The most efficient aeroponic system market and especially the most compact in terms of height. Particularly well done (100% ABS plastic food and UV), this system will become a staple in aeroponic culture thanks to its extreme performance, simple and reliable system. This aerotop is composed of a tank of 18 liters, filled with nutrient solution comprising an easy access with a removable hatch and a graduation of the reservoir providing a quick overview of the level of remaining nutrient solution. It is also composed of a "tray" (culture dish) that is used to create a root chamber between the Top aero (lid) and tray, guaranteeing perfect oxygenation and stunning growth of your plants. An irrigation system is integrated directly into the tray to obtain, thanks to 360ÌÇå sprayers, spray a perfect nutrient solution box itself gulp of oxygen, and distributed throughout the root room. This system will give you the best results in the market. A Franco-Canadian collaboration: developed in France and manufactured in Canada. XtraPump pump 750L / h. Irrigation and baskets included. "MODULAR" since this system is convertible into no time in HydroStar in Aerostar; in HydroPro or AeroPro.